A good reason to write a newsletter is to share some exciting news! Our rare antique Zejwa rug has been shortlisted through to the final group for the 2012 LAPADA ‘Object of the Year’ competition, heading through to the next round of judging. After the success of last years entry, an unusual green Karachov rug reaching the final, we will be hoping this perfect condition Zejwa rug can go one step further. Woven in the northern Kuba region of the Caucasus this particular type of rug are easily distinguishable due to their elaborate repeating ‘Sunburst’ motifs. As with any hand woven rug each piece will have different attributes which help determine the rugs beauty. Being a nomadic weaving often their shape can be distorted as the looms get removed from the ground and set down again once the weaver has moved on and settled on a new location. 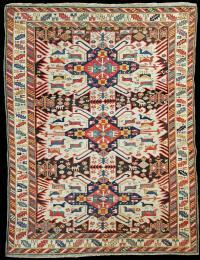 This rug displays great accuracy in weaving technique, as each motif has carefully been woven with a good degree of symmetry. Often one or all three large ‘Sunburst’ motifs will be varying in size and shape thus making the rug look primitive to the eye. The weaver who set out 140 years ago or more to construct this rug took great pride in their work and ended up producing an exquisite piece, enhanced by the natural dyes allowing us to marvel at a rare piece of rug weaving history. You can view the rug on our website by clicking here.